Robert Lindsay machte vor ein paar Jahren einen fatalen Fehler! Er sprang von einem Absprung kopfüber in Richtung Wasser. Doch er hatte die Situation falsch eingeschätzt und schlug mit dem Kopf auf dem Boden auf. Sein Gesicht wurde durch den Aufprall in 2 Hälften gespalten. Er lebte noch 2 Tage weiter. Doch dann starb er an seinen heftigen Verletzungen. PS. Das Video ist nichts für schwache Nerven! Da scheint jemand das Internet neu entdeckt zu haben! Krass! Inwiefern sollte dieses Video nun als Diskussionsgrundlage dienen? Was ist der Punkt? Jemand macht etwas unssiniges und verletzt sich dabei? Physikalische Gesetze? Sachen gibt's! Sicherlich unangenehm, aber es gibt Leute, die sich bei einem Selbstmordversuch das komplette Gesicht weggeschossen und das ueberlebt haben! Ich kann jetzt auf keine direkten Erfahrungswerte zurückgreifen aber finde ich doch, dass unangenehm dem Geschehnis nicht gerecht wird. Sich den kleinen Zeh an der Tischkante stoßen, oder mit der Tür drüberziehen, das ist unangenehm! Ich bediene mich gerne des Stilmittels der Untertreibung. Soll sich mal nicht so anstellen der Typ! Was ich damit ausdruecken will, ist, dass so schwere Kopfverletzungen durchaus zu ueberleben sind. Was mich in diesem Fall aber total stutzig macht, ist die Tatsache, dass es dazu null Berichte gibt, nur Videolinks. Auf Blogspot gibts nen zusammenfassenden Text von Oktober 2009 mit diversen Quellen dazu. Ich kopiere den Kerntext zur Recherche hier rein; die Quellen finden sich im Link. Scheints gibts zu dem Video diverse Storys über Leute die nach der Betrachtung unheimliche Symptome aufzeigten, ähnlich wie bei der Creepypaste zum Lavender Town-Syndrom, zu der wir ebenfalls nen Thread haben. Auch die Kommentare zum Text sind interessant; gebt dem Autor bitte alle mal nen Klick. Bad reactions to the video, including nausea, vomiting, dry heaves, paleness, goosebumps, shivering, shaking, spinal chills, sweating, headache, rapid heartbeat, anxiety, nightmares, sadness, crying, inability to stop thinking of the video and pain in the face, have been reported. Adverse reactions, some debilitating, have lasted up to two weeks. Please exercise caution in viewing the video. This is one of the hot viral videos going around. It actually appeared on the Net around the third week of July 2009, but it only started going viral in a huge way around the second week of September 2009. In general, it never has a name. It first appeared on Arabic and Turkish sites and finally found its way around the Net. It's referred to by some description of the event like Horrible Diving Accident, Bridge Fail, Worst Diving Accident, Horrific Diving Accident, Awesome Diving Accident, Disgusting Diving Accident, Jump Accident, Cellphone Horrific Diving Accident and Diving Accident. I named it Dive Fail since I could not think of anything better. A teenager, a 16 year old boy, dives off the seaside promenade in Beirut, Lebanon and slips before the dive. The slip causes him to miss the ocean and instead hit the concrete slab below where fishermen fish. He hits the concrete face first, then goes into the ocean. In a short while, the ocean for yards around has turned red with blood. There are people and boats in the water trying to help the guy, and girls are screaming all over the place. The scene then shifts to a hospital where the poor guy is being overseen by a team of doctors and nurses. His face has been split clear in two down the middle vertically! He is still alive, conscious and breathing, and his tongue is moving around. He appears terrified. The doctor takes the sides of his face and pushes them together a couple of times to make a whole face again. The doctor says, "Where do I begin?" a few times in Arabic. The water has gone completely red in this horrifying image from the video. The rescue team with a boat can also be seen. People who think the video is fake say that the water is too red, and the blood he lost could not possibly have turned the water so red. When blood loss occurs in water, the water is almost like a medium for the blood and allows it to spread a lot as it mixes. This can cause a little bit of blood to look like a lot of blood. This is not to say the victim didn't lose a lot of blood, but the color of the water makes it appear as if he lost more than he did. People are wondering how he could survive such an injury, and the front part of his brain may indeed have been injured, but others are saying that it appears to be intact. At any rate, basic things like breathing are done by the brain stem. The brain stem does not appear to be injured. People are also wondering about pain. 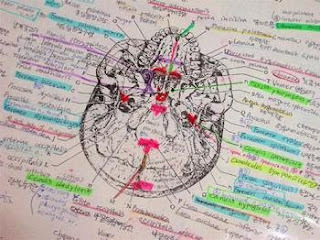 The brain has no pain receptors. On the other hand, the damage to his face must be very painful. There are a lot of rumors saying that this video is fake, but it is a real video. We know this because people in Lebanon are reporting it. Some had friends who were at the Promenade that day, others said it was reported in the Lebanese press and others say they were aware of stories on the street about the video. There is an article in Arabic from the Lebanese press online proving that this event occurred, but it's in the archives, and looking through the archives costs money. This event occurred in Beirut in the second week of June 2009. The teenager and his brother were showing off their diving skills by diving off the Manara Promenade (photo), which is right across from the American University on the shore of Beirut's harbor. This part of the Promenade is called Al-Rawsha, and it's long been popular with divers, although officials have always frowned on it. Like the Golden Gate Bridge in San Fransisco, California, it's also long been popular with suicides and attempted suicides. It's a long way off the Manara Promenade to the ocean, over 40 feet. 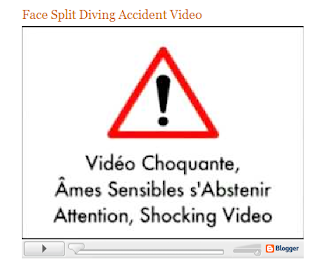 The first part of the video shows his brother making a successful dive. The victim and his brother had made several jumps before, and everything had gone fine, but this time the victim slips and disaster unfolds. This part was shot with a Nokia cellphone that shoots dark in the afternoon. The segment was shot by a girl at the scene who can be heard screaming, "Oh my God! Oh my God! Someone call the Civil Defense!" in Arabic. Some say his friends would not shoot movies of him diving, but the girl filming is just some girl who was there filming the divers. Lots of people use their cellphones to film the divers. This actually is not the original video from Lebanon. 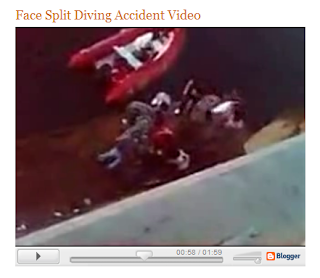 In Lebanon, there were two videos, the first one of the diving accident. This one started going around Lebanon later in the day after the accident. In the original Lebanese video, there is no fade out after he hits, for one thing. The original video from Lebanon is not currently available. The second video was shot in the hospital and started going around later. The video on my site is the two different videos spliced together. The second part of the clip is the same kid in the hospital, but was shot with a different cellphone so it looks different. The hospital staff is definitely speaking Lebanese Arabic. This part of the clip was shot in the brightly lit ER of the American University Hospital, which is only ¼ mile away from where the accident took place. That's why things are so much brighter in this part of the clip. People say there is no way a cellphone would have been allowed in an ER, however, in the Developing World, it is quite common for family, friends, etc. to be present in the ER right next to the patient's bed as the staff hovers around them. It's also not uncommon that they have a cellphone on them and record the goings-on. That would be unheard of in the US, but in the Arab World, no one thinks anything of it. As you can see in the hospital footage, they have the boy intubated, which is an excellent idea. However, he is not on a ventilator, nor are there any signs of monitoring equipment such a pulse oximeter. Also they did not put him in C-Spine precautions (C-collar, backboard, strapped down). The physician is focusing on holding his face together, possibly in order to protect the airway. Critics say the doctor is "playing" with the face, and no doctor would do that, but I don't think he is playing with it. I think he's trying to fix it. Some US Medical personnel say the video is fake because he is not receiving proper medical care. Keep in mind that this is Lebanon. He is getting reasonable medical care, but he is not receiving the best of medical care. In this case, the best care would be the following: Put the victim in a drug induced coma for most of the time. Start with the major things like checking the frontal bone (forehead) to ensure the brain is safe, maintain vascular supply to tissues, deal with the airway (victim would need a tracheotomy), try to save his vision and go from there. After that, try bone fusions/pinnings to repair bones and muscle re-attachments to repair muscles. Skin and soft tissues would be dealt with last. There would surely be a hell of a scar afterward. In this case, all the surgeons could do was to stitch up the deep and severe wounds in his face. Although some clinicians on the Net say that a good ENT could patch this kid up, this poor guy could not be saved. All the surgeons were able to do was keep him alive in the ICU for two days before he died. The death was due to spinal fracture and in particular severe internal bleeding in the brain. Death was due to internal bleeding. A lot of people in Beirut gave money to his family after he died. An interesting sketch of the man's wound taken from the Net. Through done in a stereotypical deliberately amateurish manner, there is something creepy about this sketch. After this accident, the city put up a fence at this spot, but reportedly young males soon bent the fence so they could keep diving and now they get a long running start so they can clear both the fence and the slab in the water below. Crazy! However, another report out of Lebanon says that police patrol the location now and don't allow any diving. Before this accident, there were a number of other horrible diving accidents in this area, all involving teenage boys and young men. There are reports linking to a different Web video that supposedly proves that this video is fake. The video shows the same hospital footage. In the other video, which appeared on the Net around the same time this one did (June 1, 2009) the hospital footage is said to be of a failed 9mm gun suicide. However, a 9mm cannot do that kind of damage to your face. Furthermore, in a longer video version of the ER scene, the two doctors are discussing in Lebanese Arabic how the young man landed "on a rock" when he jumped into the water. This dialogue would not exist in a gun suicide video. Unfortunately, I deleted this video from my drive. A drawing of a skull from a medical textbook. There are claims that instead of a 9mm failed suicide, this is a shotgun failed suicide. However, there are many photos of shotgun suicides on the Web, for instance, at Rotten.com. Shotgun failed suicides do not neatly clove one's face in two like this. What are the chances that a video of a failed shotgun suicide by a young man occurred and was filmed in Lebanon around the same time of this accident? Another report says that the hospital footage is from a guy in Saudi Arabia who got hit in the face with an ax. That would certainly account for the injury and the Arabic speaking hospital staff. However, Saudis do not speak Lebanese Arabic; they speak a completely different Arabic language that is quite distinctive. Further, female staff in a Saudi hospital would be wearing more than a mere hijab I think. There are reports that this took place in other places such as Accra, Israel, and Brazil. Accra is a port, it does have many Arabs who speak an Arabic dialect very similar to Lebanese Arabic, and it has a promenade like in Beirut. In Brazil, people would not be speaking Arabic and the female hospital staff would not be wearing hijabs. Sources in Lebanon who were there at the promenade and witnessed the dive accident say the word on the street in Lebanon is that the second half was shot in the hospital and is footage of aftermath of the diving accident. Many have questioned the nature of the boy's wound. It does not seem possible to hit a concrete slab and split your face vertically like that. However, if you look at the dive footage, there is steel casing around the concrete slab that he hits. The concrete slab has worn away, and the steel casing is exposed. The steel casing runs parallel to the shoreline. Even then, hitting the steel casing would seem to be a horizontal hit that would not cause this injury. But look at the way the boy is flailing wildly in the air. In his dive, he is twisting and turning like the wind. With such a flailing dive, and probably curving to try to avoid the concrete, it's possible for him to turn the 90 degrees he needs to hit the sharp edge of the steel casing vertically instead of horizontally, which would result in the injury we see later. A very interesting capture from the diving video at the moment of impact appears to show that in fact the diver did hit the very sharp eroded steel edge of the fishing platform. 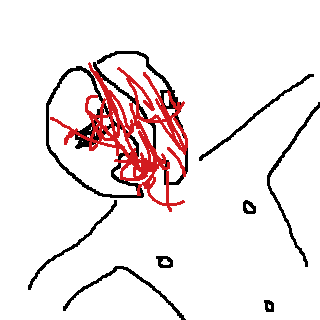 If he was twisted around so that his face hit the edge vertically instead of horizontally, he could have indeed ended up with the split face wound seen later in video. Another theory is that the hospital footage is not real - it's faked using special effects. Looking at the cheap quality of the video and the fact that faking something like this is the terrain of motion picture studios with huge budgets, it is clear that the guy in the hospital is not "some rubber thing." One problem with the video is that the hospital guy is quite pale, while the jumper is a typical brown-skinned Arab. People say this means they are two different people. However, it could be the same kid in the hospital if the diver lost a lot of blood. Another suggestion, perhaps not as odd as it sounds, is that the boy is already dead on the ER table. The body can make a few involuntary movements after death - there are death rattles - and the breathing could have been artificially forced by the tube. But why intubate a dead man? And if you look closely, you can see that his tongue is moving, and his chest is going up and down. He appears to be gasping for breath. A funeral director on the Web felt that he was still very much alive. Until can sort everything out, this video will remain mysterious. There is something really creepy about this video that I can't quite put a finger on. From the very amateurish trilingual warning at the beginning -Arabic, French and English - (the movie was made by a Moroccan man named "M.M. of Casablanca, Morocco" who came to my site and commented but left no further details) to the horrible screams after he hits, to the blood-red ocean spreading in a large area around the 20-30 people gathered in the water to help him, to the absolutely terrifying scene in the hospital where the poor kid, incredibly, has a face split clear in two - the horror starts from second one and keeps building till the end. 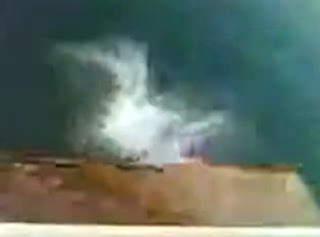 A copy of the amateurish text at the beginning of the video, suggesting once again that the entire video, including the uncertain footage at the end, was made in Lebanon. The labored, terrified breathing of the victim combined with what appears to be a look of horror on what's left of his face is something that really stays with you. Throughout the video, there is weird, cheesy, hard to describe instrumental background music that for some strange reason that adds to the fear. This music is actually the soundtrack to a medical show on US TV - either from ER or Chicago Hope. The amateurish cellphone footage that jumps around jerkily also somehow makes the video frightening. I was traumatized for several days after watching this thing, and I've watched a lot of nasty stuff. Wer zu zart besaited ist, sollte sich das in der Tat nicht anschauen. Ist schon recht eklig. Aber ich bleibe skeptisch! Ob so eine Verletzung jetzt wirklich von einem solchen Sturz herruehren kann, wage ich nicht zu beurteilen. Was ich allerdings aeusserst merkwuerdig finde, ist das Verhalten der Leute im Krankenhaus! Man sollte doch meinen, dass bei so einer Verletzung die Kacke am Dampfen ist und alles am Arbeiten ist. Aber NEE! Der Arzt oder was auch immer das sein soll steht da und haelt das gespaltene Gesicht abwechselnd auf und zu, damit man's schoen sehen und filmen kann, die Krankenschwester (?) neben ihm laechelt charmant in die Kamera, und mitten in den Gesichtsresten steckt ein Intubationsroehrchen (sollte die Intubation bei einer so starken Gesichtsverletzung nicht direkt ueber einen Luftroehrenschnitt erfolgen? Wie haben die in dem Durcheinander ueberhaupt gefunden, wo es hin muss?). Ausserdem ist der Patient anscheinend wach und bei Bewusstsein! Klar, angeblich soll es im Libanon passiert sein, aber man sollte meinen, dass es auch dort halbwegs faehige Aerzte gibt, oder? Also ich kann mich erinnern das Video mal vor Jahren gesehen zu haben. Fand es auch ziemlich krass, aber es hatte keine negativen Nachwirkungen auf mich.
Man muss sich über sowas auch nicht den Kopf zerbrechen. Bei Urban Legends und Creepypastas, die sich um Videos, Gemälde, Games oder so drehen, ist das ein normales Stilmittel; vgl. wie gesagt das Lavender Town-Syndrom. Wenn man die Story gut erzählt, kann das auch durchaus nach dem tausendsten mal noch eindrucksvoll sein. Was soll man auch sonst machen, wenn man z.B. über ein verfluchtes Video erzählt. Ist man ganz platt, weckt die Betrachtung halt Selbstmordgedanken oder macht Leute zu Mördern. Hier hingegen passt das Zeug irgendwie nicht; die Urban Legend in ihrer Basis ist nicht paranormal, und diese Schilderungen bringen das Konzept irgenwie so pseudomäßig rein. Das ist halt Splatter, aber davon hat doch keine Sau wochenlang Kopfweh. Hier werden dadurch sogar eher noch mehr Zweifel geweckt als ohnehin schon. Perfekte Wortwahl, wenn man den Thread-Inhalt bedenkt. Stimmt. Es gibt keinen Zusammenhang.